Why am I writing a review for an August subscription box when it’s nearly October? Well, I live in Florida and hurricane Irma took over my life for a while. But everything is okay; I’m safe, my apartment is fine, my power is back, and I’m ready to focus on my blog again! So, what better way to get back into the swing of things than to take a look at something that has really impressed me this month: the Medusa’s Makeup subscription box! This is the third box that I’ve ordered from Medusa’s Makeup. My first box was amazing, but my second box wasn’t too great. I decided to give it another chance, and I’m so glad I did; this box is definitely my favorite so far! As you can see, this month came with a nice variety of items; a pan of their Totally Baked Eyeshadow, loose shadow pigment, false lashes, and a metallic lip gloss. These are all full sized, vegan, cruelty free products. The box cost $15.95, but has a value of $37. I will actually be giving the lashes away to a friend, because I never wear falsies. These do seem to be of great quality, but I just hate the way false lashes feel on my eyes. If you look through any of my posts, you’ll notice that I just stick with mascara. So, let’s move on to the other items. First I want to talk about the eye dust they sent me. The marvelous, shimmery, ethereal eye dust… You know, I think it should be called fairy powder instead. Eye dust makes me think of that crusty stuff in the corners of your eyes when you wake up! Anyways, this is anything but crusty. They sent me a gorgeous lilac shimmer shade called “Ultra Violence”, which retails for $8. This is a silky shadow that glides on the eyes like butter, and also makes a great highlight. It is quite small, but a little goes a long way. Next, I received a Totally Baked Eyeshadow in the shade “Whatever”, which retails for $9. This is a gunmetal grey shade that is super opaque and bold. The pan is really large, which I love as well. I like this even better than a baked eyeshadow I received in my first bag, which I actually raved about. 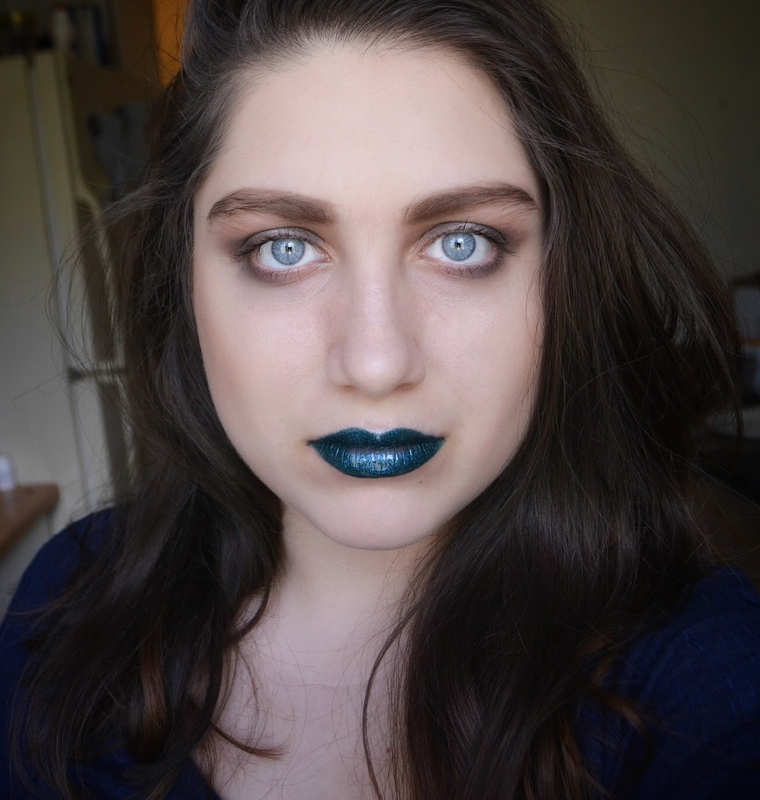 The final item is the Metal AF Metallic Lipgloss in the shade “Crazy Train”, which retails for $11. This is actually my favorite item in the bag, and I have been wearing it all the time. They market it as a lip gloss, but it acts like a metallic liquid lipstick. It goes on smoothly like a gloss, but it dries down to a metallic matte finish and it is transfer proof. This is such a gorgeous ox blood shade, which will be perfect for the upcoming fall months. I used both eyeshadows and the lip “gloss” in today’s makeup look. I have the totally baked eyeshadow all over my lid, with the eye dust in the inner corner and middle of the lid. I also am using the eye dust as a highlighter, for a subtle lilac glow. And, obviously, I’m wearing that rocking lip color! I really hope you enjoyed this review! I am still loving Medusa’s Makeup, and I can’t wait to see what next month brings!